Recently we had a school snow day (I know, a SNOW DAY in SPRING! Crazy Canada.) We decided to make the most of it and make something fun! My littlest loves silly putty. 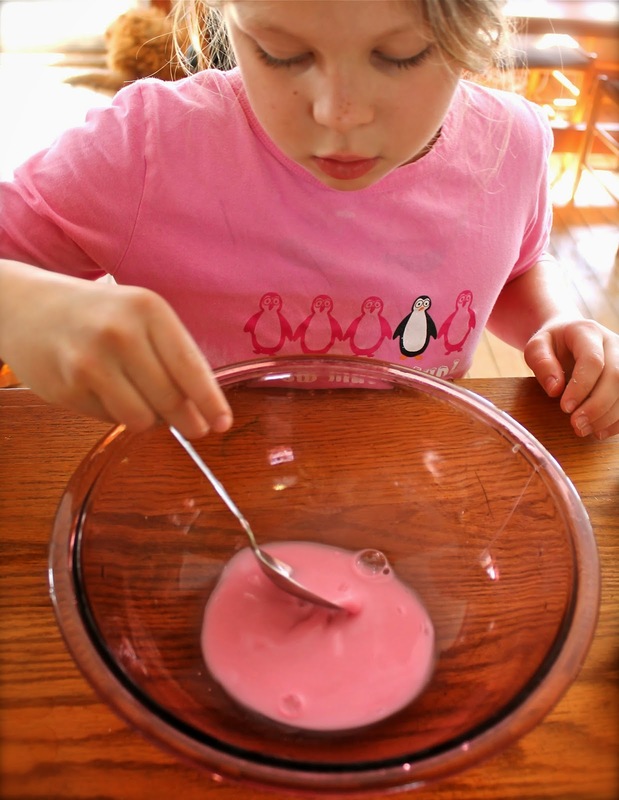 I had come across some recipes online awhile ago and thought we would give the homemade silly putty a go. We followed a few different recipes, playing with all the amounts until we got the results that we wanted. Squishy but not runny. Perfect for play! Once we discovered the magic combination my gal was able to make this all on her own in minutes! 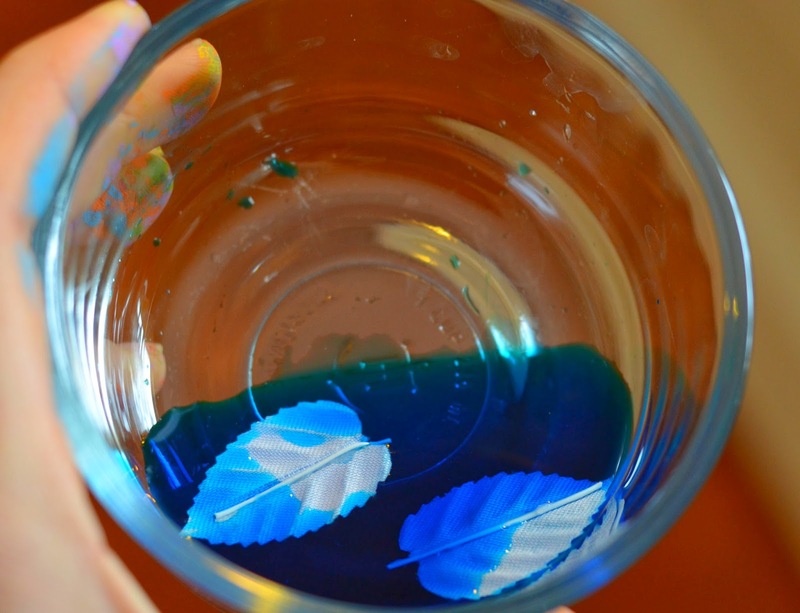 Place 1 tsp of paint into a bowl. Add in your 1/4 cup warm water and stir. Next, measure out 1/4 cup glue and add to your paint mixture. Mix thoroughly. 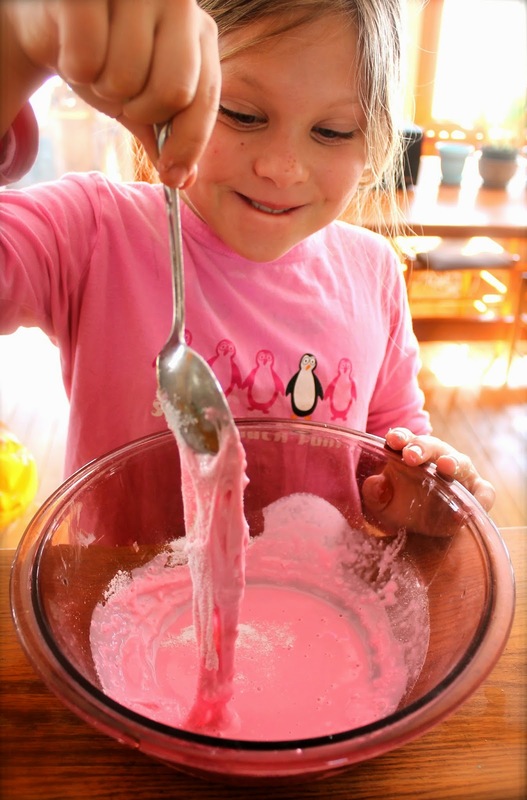 Measure out 1 1/2 tbsp of borax and spinkle over the mixture. Stir until it starts to become a gloopy mess like this. Now for the really fun part! Take it in your hands and squish it silly! It should co-operate and become some super silly putty. 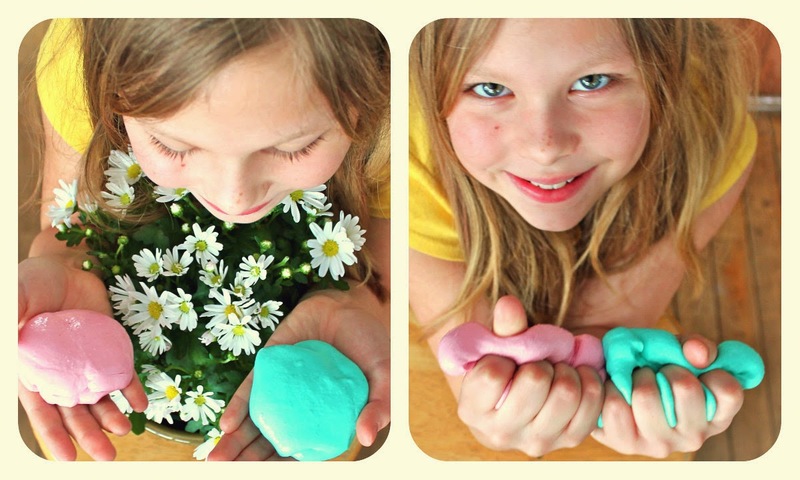 We thought we would create some Easter inspired colors of silly putty and the results were lovely! 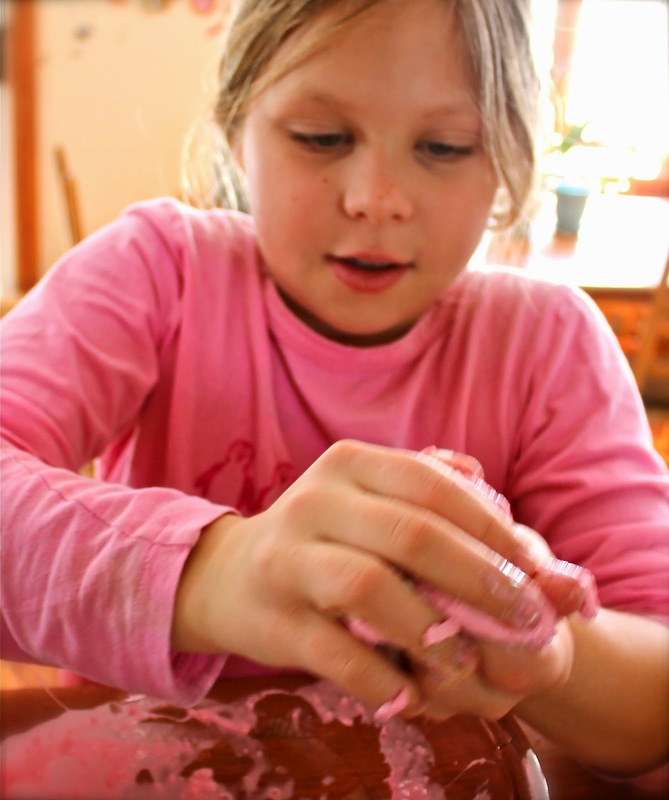 Perfect time of year to create silly putty, as we had the eggs to store it in. Just like the real deal! These shall surely fill some of our Easter baskets this year. 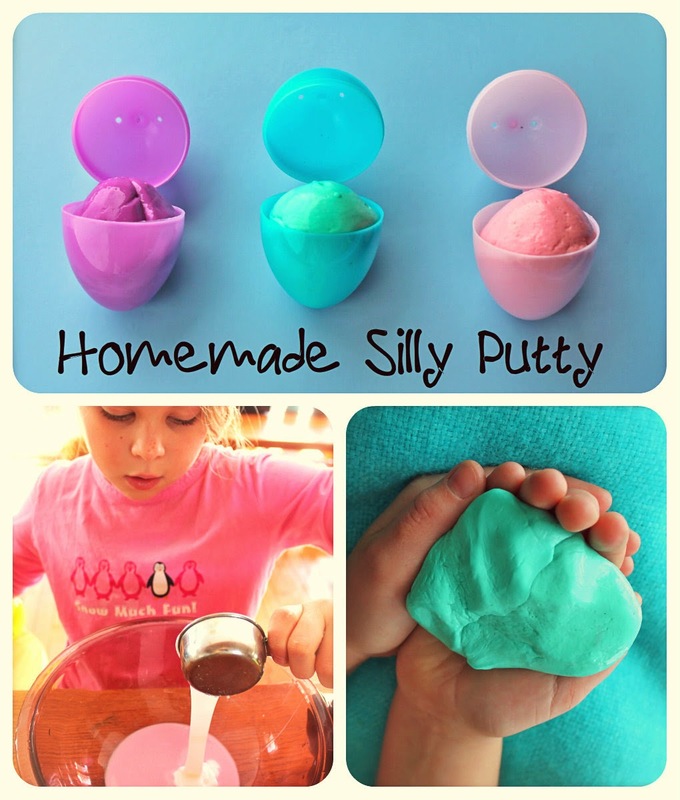 There is SO much fun you can have with silly putty! 1. Press things in to it and use it as a mold. 2. 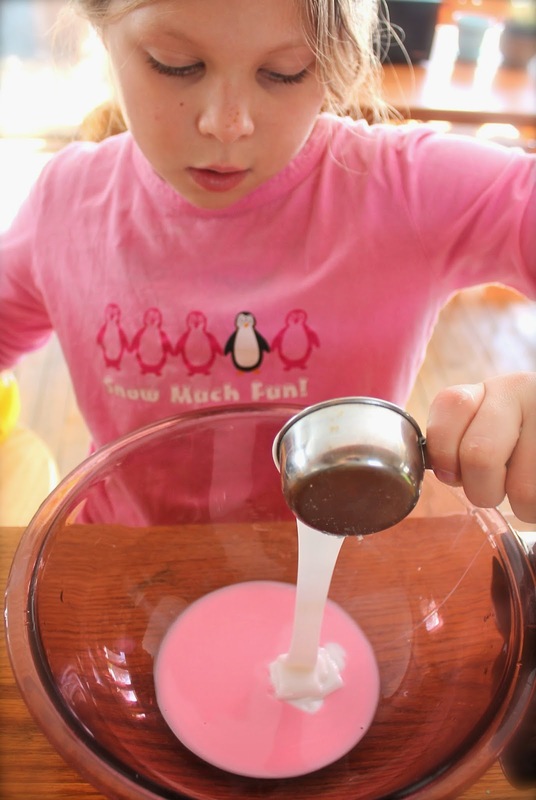 Create a bouncy ball by rolling it into a ball and placing it in the freezer for an hour. 3. Watch it float by shaping it into a boat shape and placing in water. 4. Draw a picture with pencil and press the putty flat on top so it copies the image. Squishing it! How can you resist?! 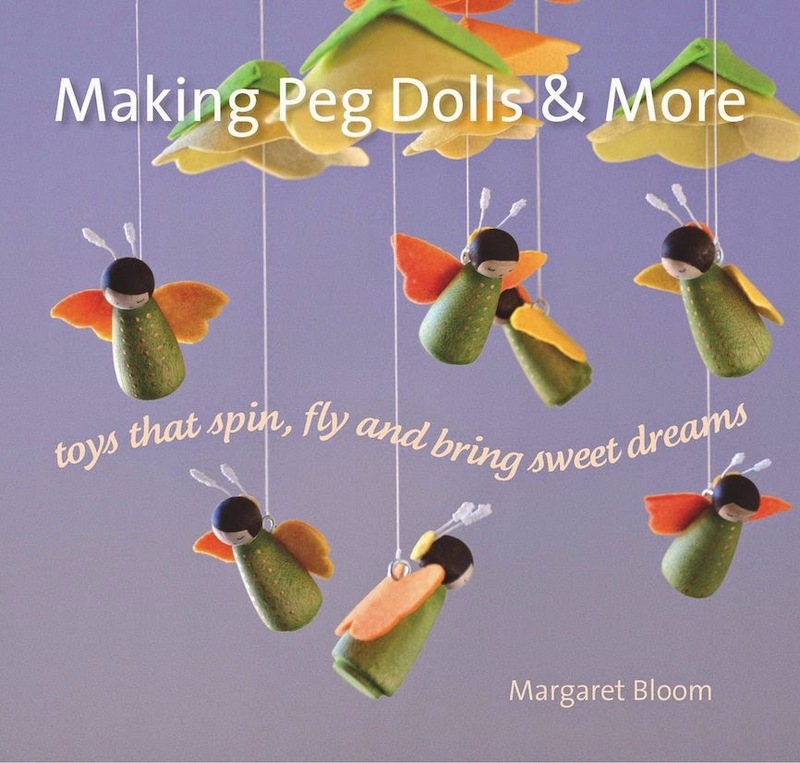 Happy stretching, bouncing, squishing and squeezing! 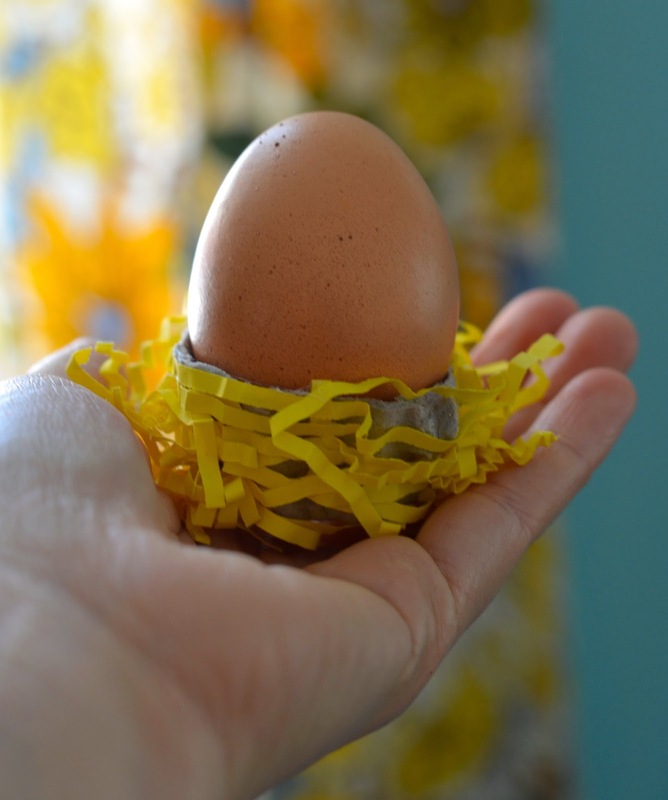 With egg crafts exploding all over the place, we wanted to do something a little different. 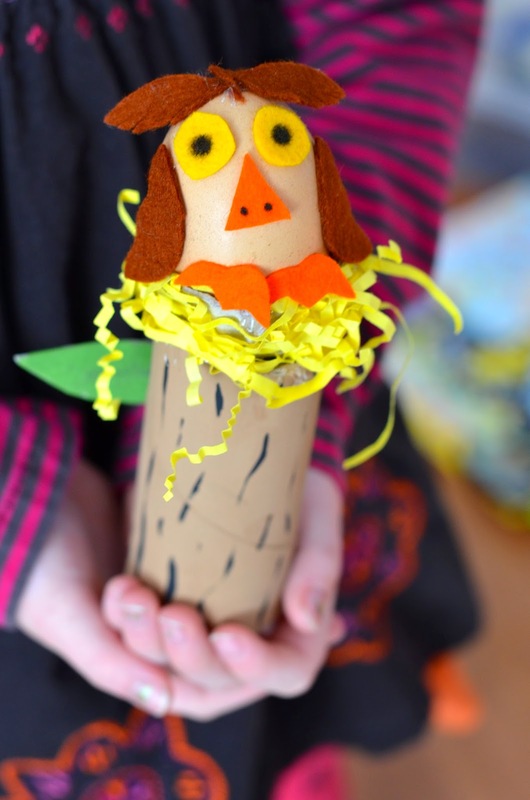 Inspired by an old paper crafting book, we tried our hand at nesting egg owls. 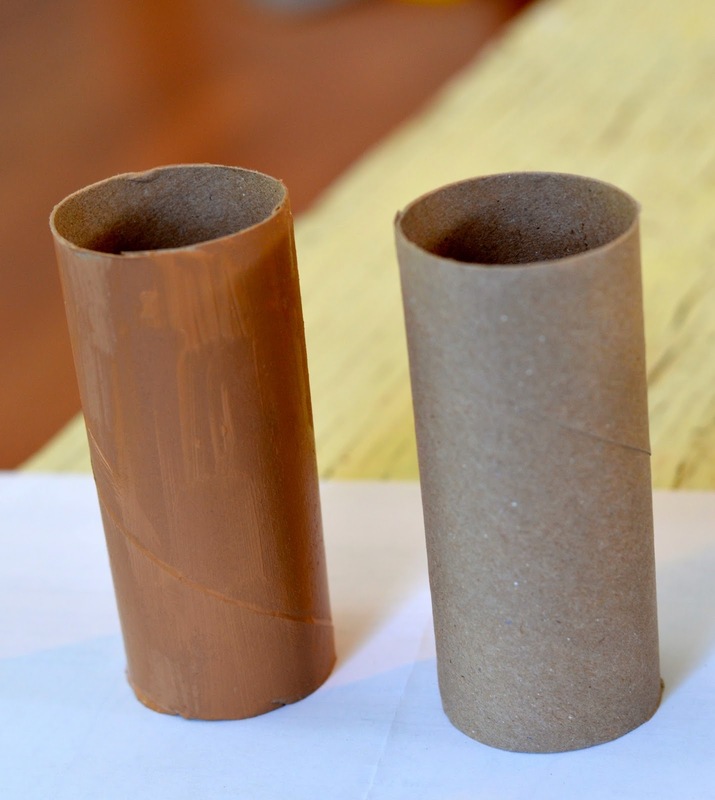 To begin…paint your toilet paper tube brown…this is your "tree" base. them green and glued them on. 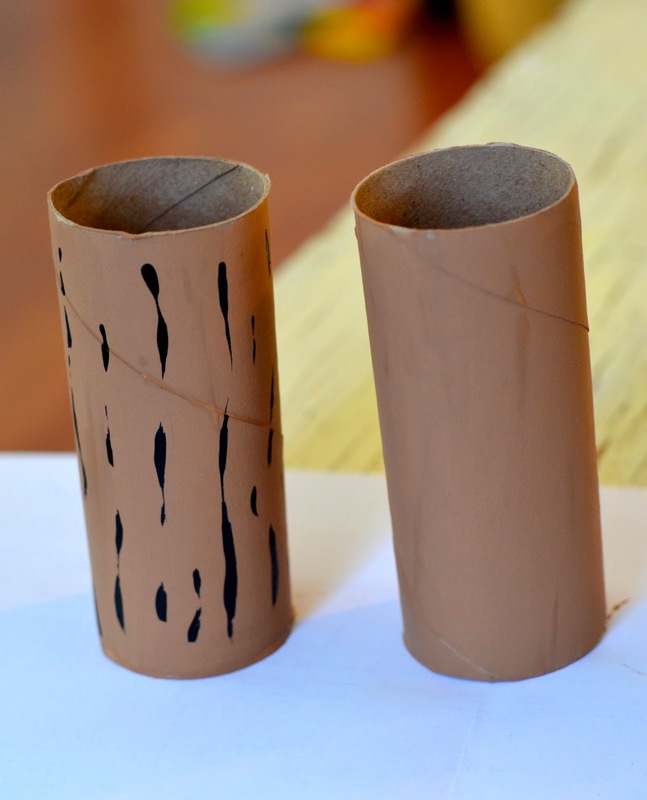 Now cut out your egg carton like so…these are your "nests"
Taking your glue gun, glue on your "nesting" material. Now glue in your egg. 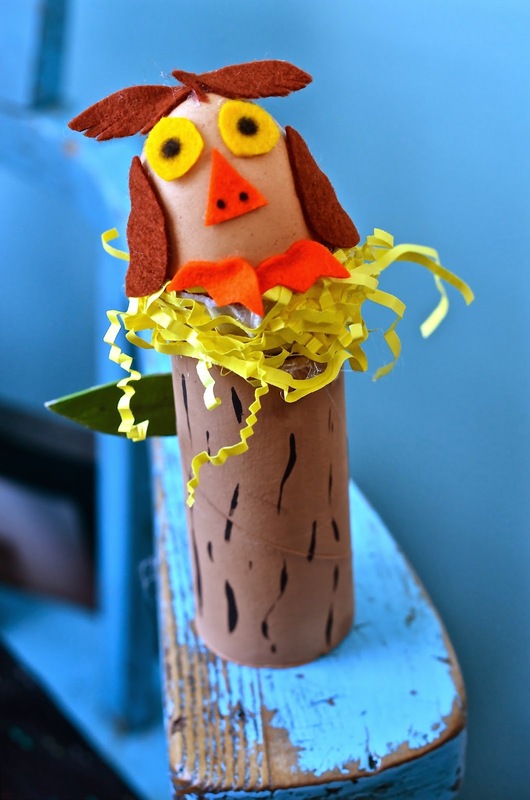 Cut out eyes…beak…feet…wings…and little feathers for its head. Glue them onto your egg owl! And the end result is something like this. Do you like to do silly surprises on April fool's day? 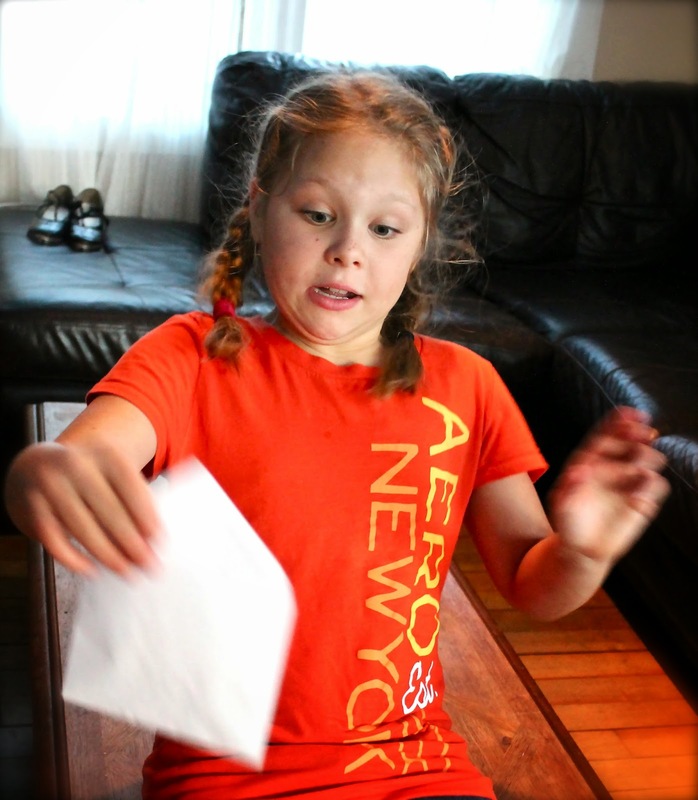 Here's one that is sure to grab a giggle or two Head on over to CBC to check it out this funny flying letter trick! Hope your day is full of lots of laughs! With spring seemingly unwilling to show it's face and snow still surrounding us, we decided to take matters into our own hands and bring spring to us. What speaks spring more than butterflies and flowers?! 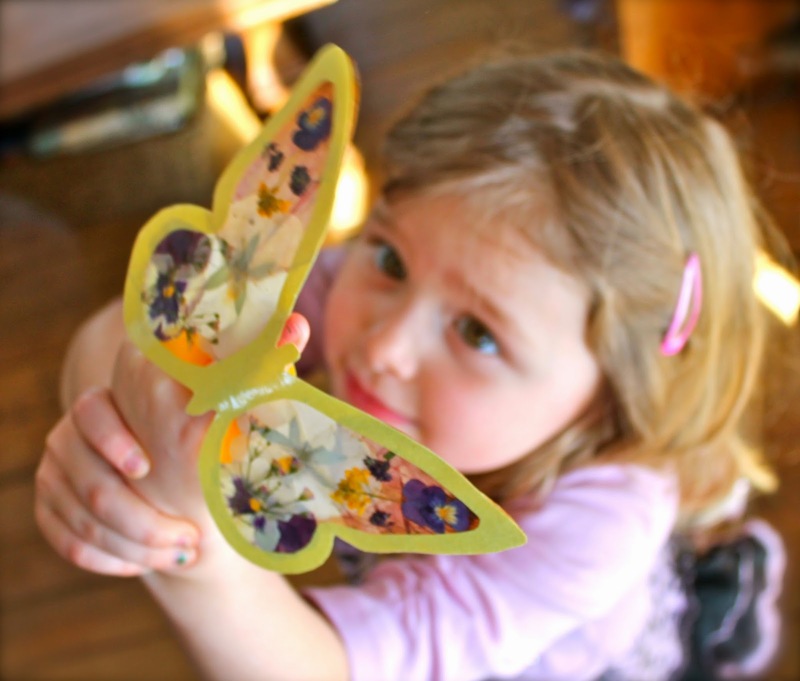 Flower-filled butterflies to conjure up spring's warmth and new life. 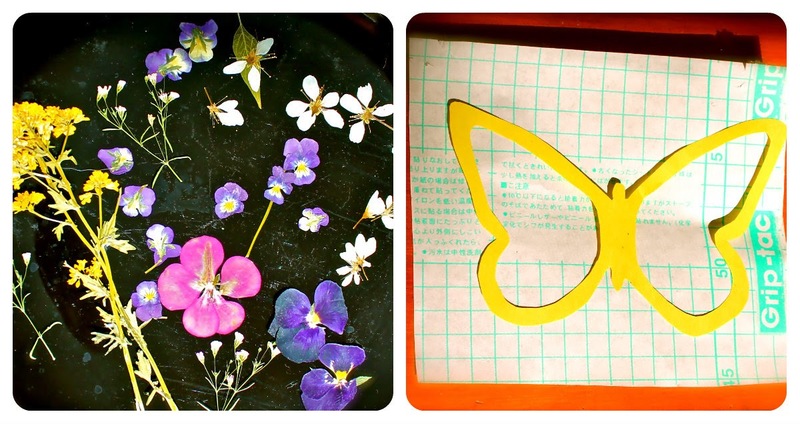 Print or trace this butterfly template onto your colored paper. 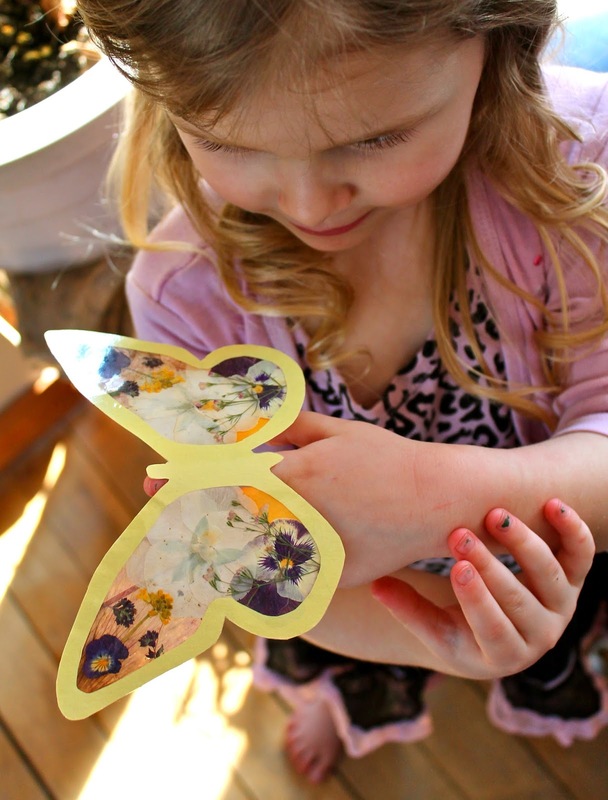 Cut out your butterfly and then cut out the insides of the wings. Cut out two squares of mactac a little larger than your butterfly. Peel the backing off one of the squares of mactac and place the butterfly on top of the sticky side. Now for the *FUN* part. 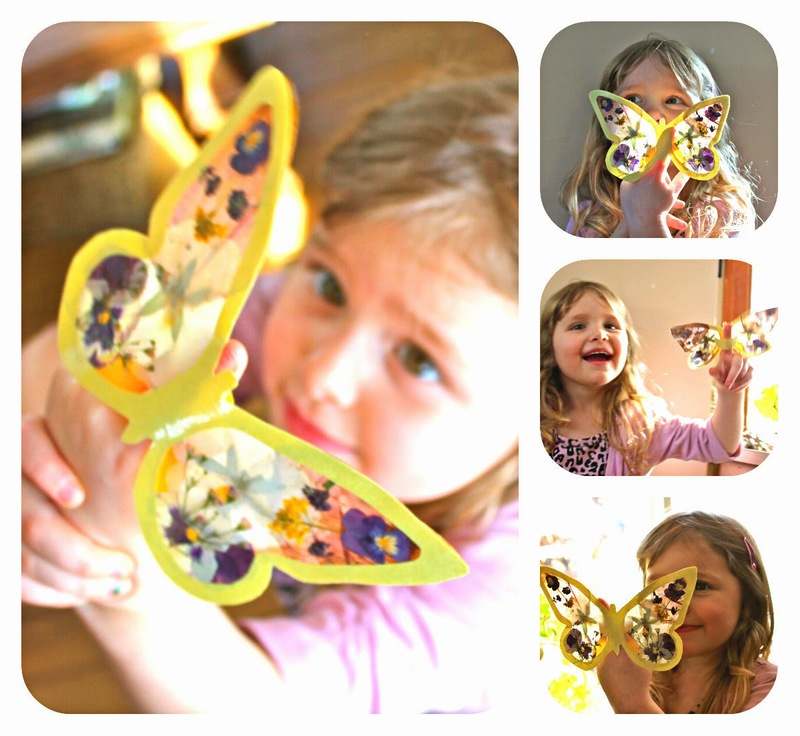 Fill the wings with flowers to make the butterflies come alive with color and beauty! When your flower collage is complete, peel the backing off your other square of mactac and press it firmly on top of your butterfly to seal your flowers in. Cut off the excess edges around your butterfly. There you have it. A flower-filled butterfly! When it was done we couldn't resist placing in in a sunny window for a bit to admire. Instant spring to make us smile. Soon it was time to let this butterfly fly. To turn it into a finger puppet, simply cut a small strip of paper and tape it onto the back to fit the finger of the "flyer". 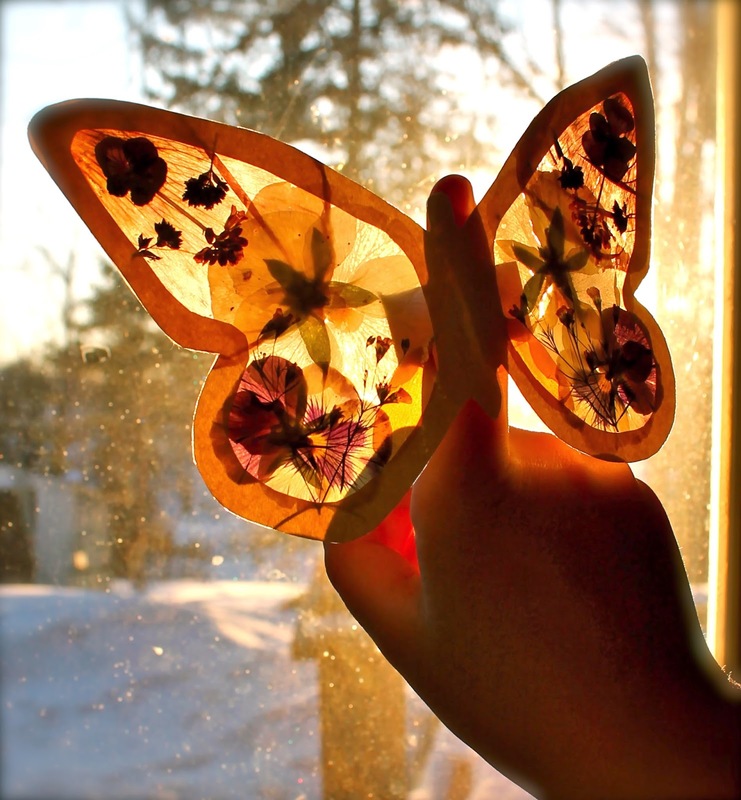 Welcome spring sunshine and butterflies! 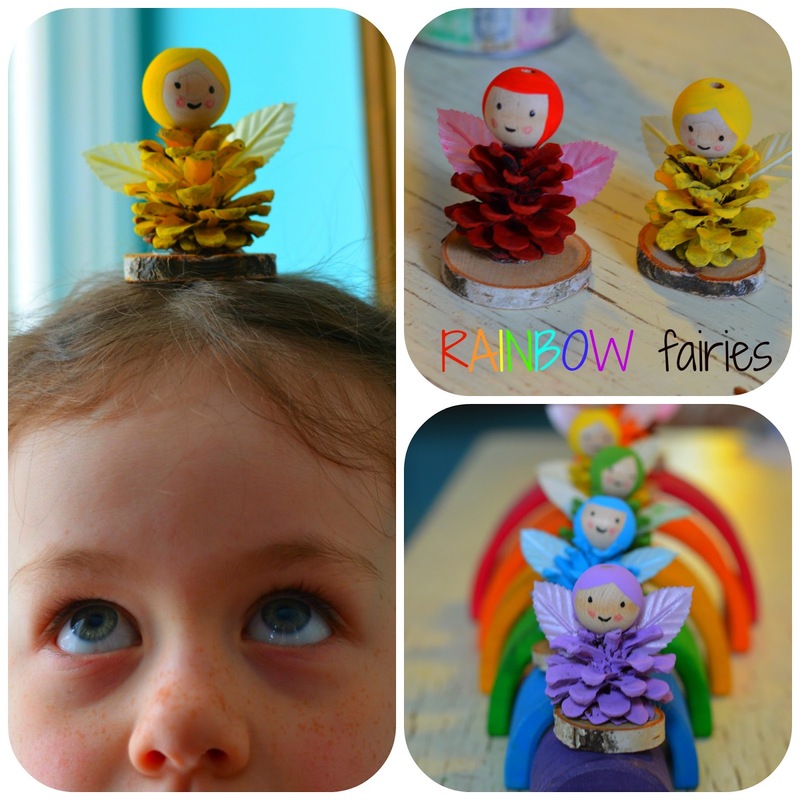 we decided to create some simple Rainbow Fairies!! 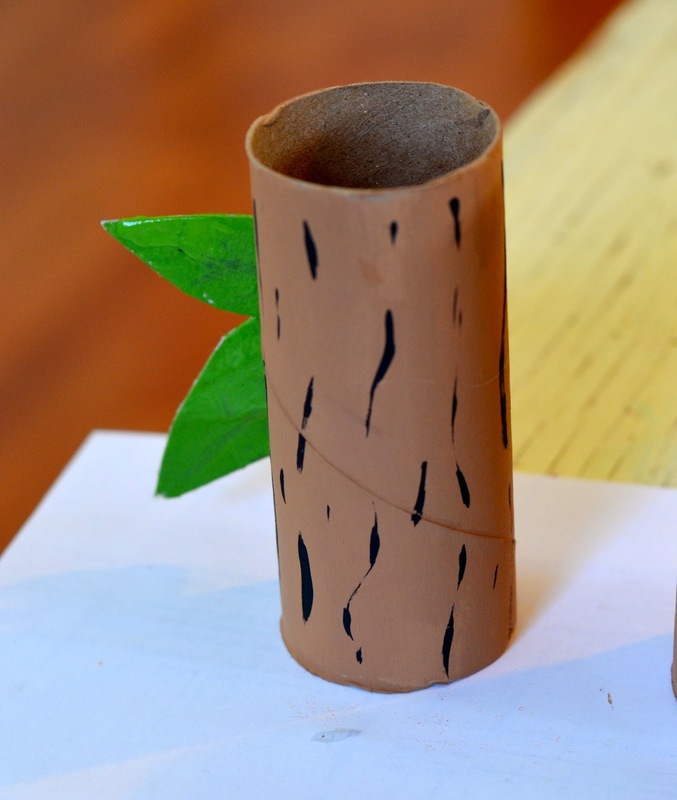 glue gun and glue sticks! 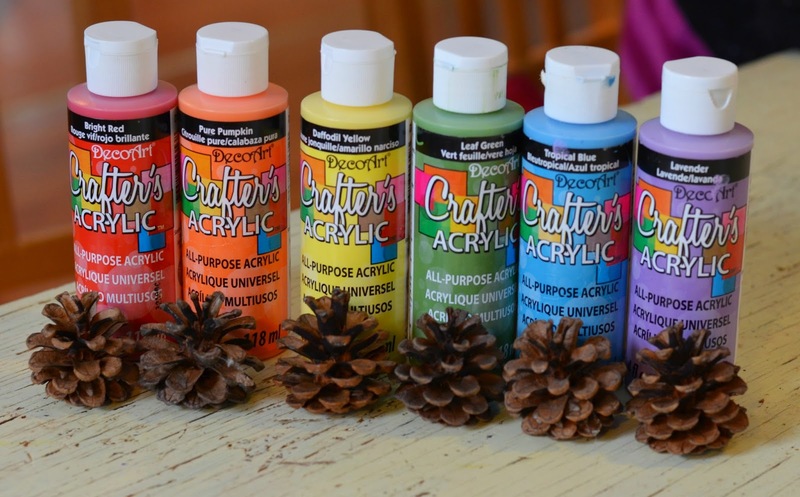 paint each pinecone a colour of the rainbow! 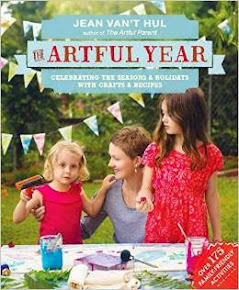 or a beeswax crayon, draw on small cheeks. soak them for about 10 min, then drain them and dry on paper towel…easy peasy! 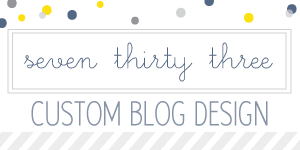 Grab your glue gun and glue on the bead "heads" and wings…they should look like this! 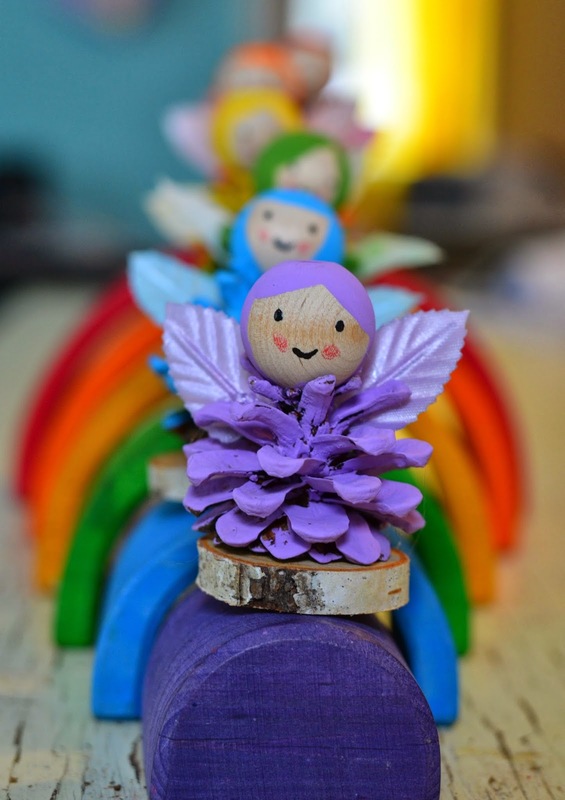 it was an inexpensive and JOY filled craft to do with my own little rainbow loving gal. 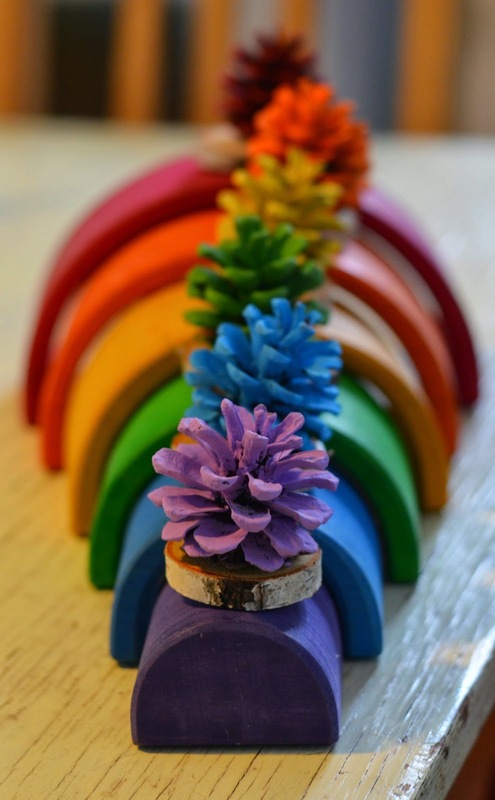 Wishing you all the colours of the rainbow! 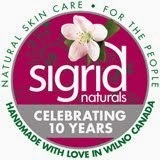 With spring now officially here (YAY!!) 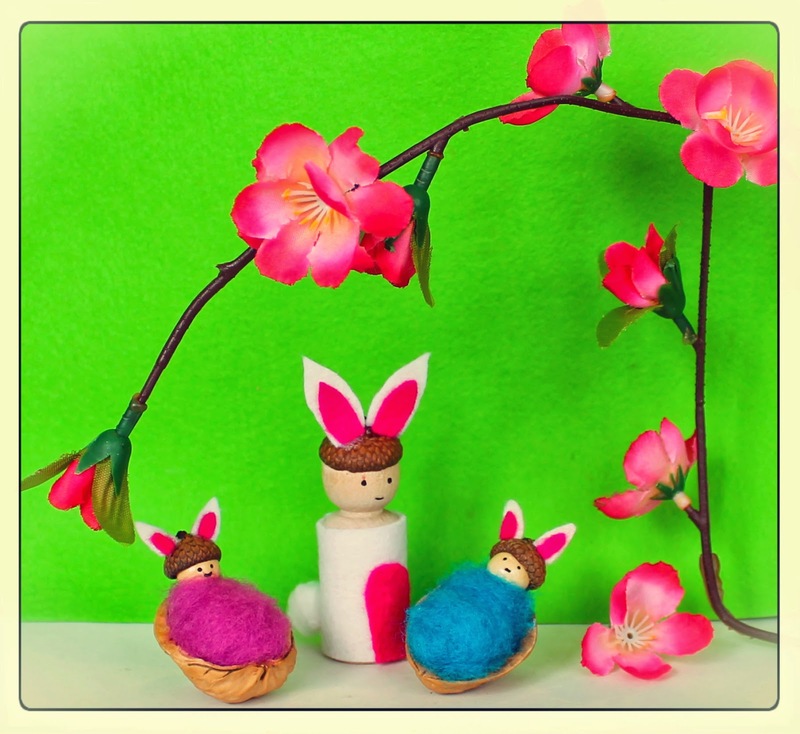 we were inspired to craft up some fresh faces for our spring nature table. My daughter Luna, has a real love of bunnies and I have a real soft spot for all things itty bitty... combined these baby bunnies and their mama just needed to be born! They were short and sweet to whip up. 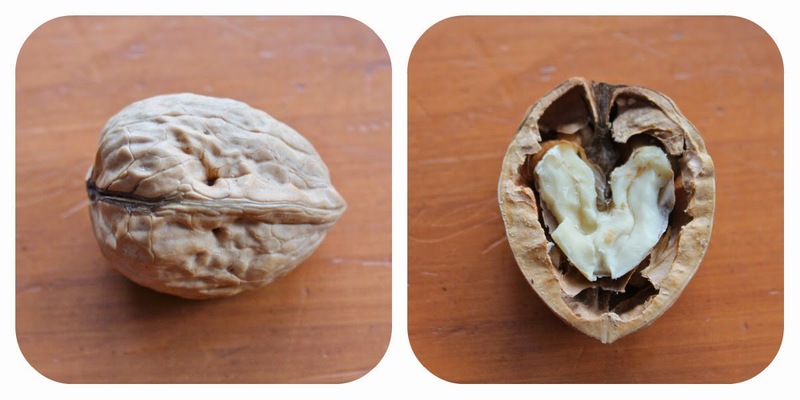 Pry your walnut open and scrape out the insides. 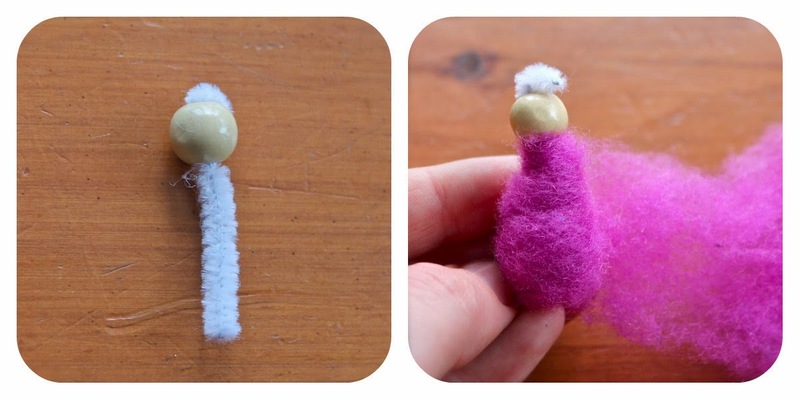 Slide your bead onto a small piece of pipe cleaner. Wrap the pipe cleaner in roving to create the baby body. Add on an acorn cap and glue the babe into the walnut shell. Cut out some little felt ears and glue on. Add a face if you wish. Measure and cut a pice of felt to cover the body and glue it on. 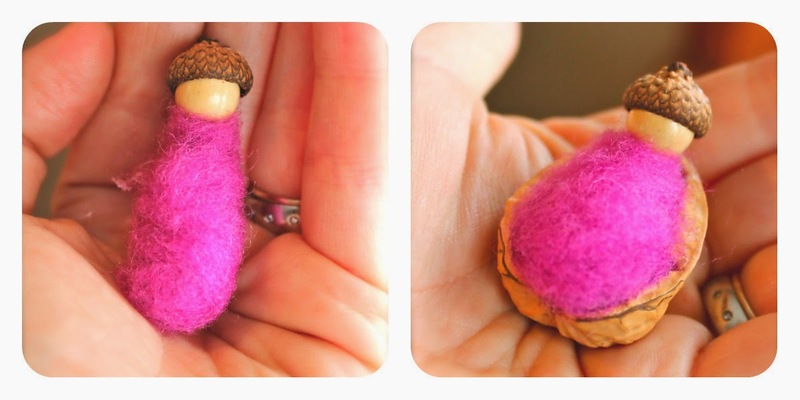 Add on an acorn cap and a face. Cut out felt ears and glue on. 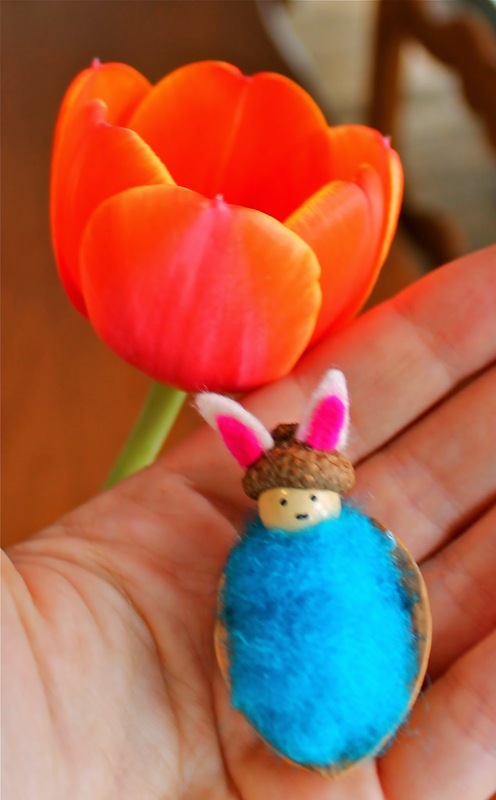 Add a little felt tummy and glue on a cotton ball tail. There you have it! Mama and baby bunny. Seeing as bunnies tend to be a bit prolific and that the bitty babies were so much fun, we couldn't resist but give him a sister. Doesn't she look so happy to be a part of things? !